The Taos Up and Over 10k race is in it's seventh year now and has gained quite a bit in popularity. The last time I ran the race was in 2008 when there were 41 total runners and I ran for third place in 1:04:05. This year there were 212 runners (I was told by one of the race officials but haven't yet seen the results to verify). 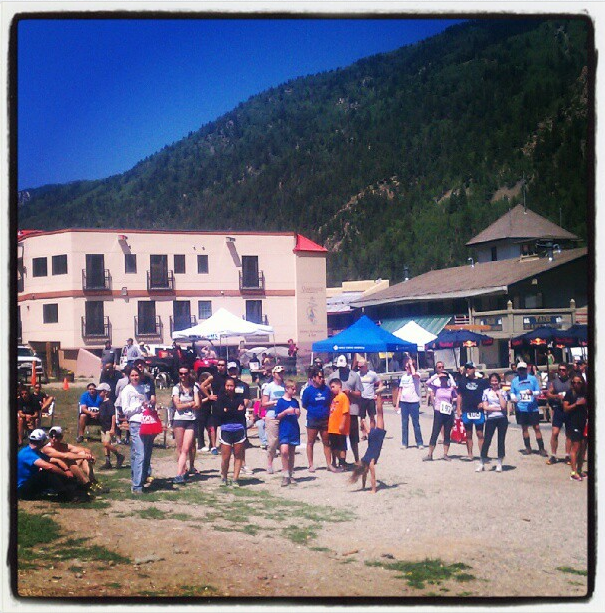 Clearly the race has grown and for good reason--it's a fun summer morning race with a nice, relaxed mountain atmosphere with plenty of opportunity to chill out at the ski lodge after the race. This year there was even a bouncy house. (For the kids, not the runners!). The turnout from Los Alamos runners this year was excellent. There must have been at least ten of us from Los Alamos, including the female winner, Petra McDowell. I hadn't been planning on running the race this year but I recently I had been feeling very good with my hill training at Pajarito Mountain and had, just a couple weeks prior, reached a hard-fought goal of mine to run sub-30 minutes up a local trail called Mitchell Trail where I ran 29:59:59, seriously! So on Tuesday of last week I signed up for the race with my only goal being to beat my previous time. I knew that would be tough because I was running well in 2008 but I knew I'd been running and training hard recently so it was certainly doable. I looked at my race report from the 2008 TUAO and knew I had reached the top of the 2,600' climb in 43:52 so I hoped to do that climb in 42 to 43 minutes this year. I ended up reaching the top in 43:27, power hiking much of the ascent, even passing others that were "running". When I hit the top the lady said, "you're four minutes behind the leader" and asked if I wanted any water. I said, "No thanks." I had purposefully ran without my hand bottle and didn't stop for water at any of the four aid stations along the mountain. I just crested the top, took my shirt off and started running hard downhill. The descent is brutally steep in a few spots between quite runnable jeep roads. At one point we ran down a ski run for a bit. Loose and steep. I wanted to fully open up my stride the entire way but it was so steep it wasn't possible--I had to keep myself in check. As we got lower on the mountain I started looking over my shoulder as I felt like I was slowing up. But a few quick glances at my GPS watch showed I was still running between 5:30/mile and 6:10/mile. 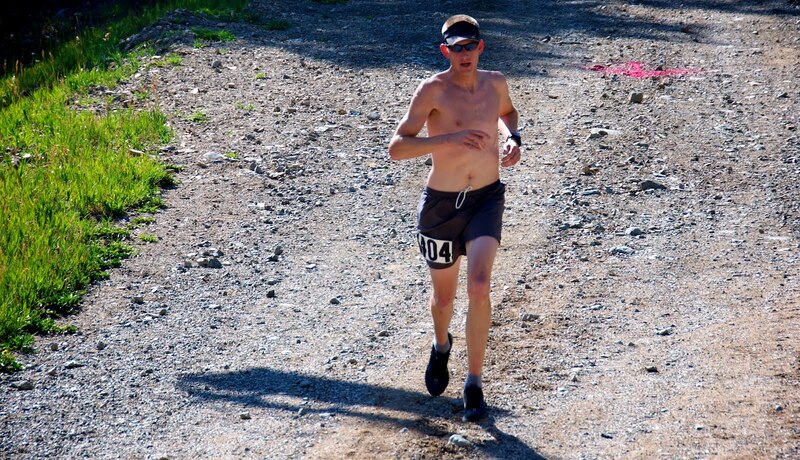 I was gaining on the runner in front of me and working hard to close the gap but it was not to be. The runner in front of me crossed the finish line about 20 seconds in front of me. I saw Allison near the finish line and strode hard to look good for the camera. I glanced at my watch and was pumped to see I had beat my previous time by 1:17. Success! The race is a fun but very difficult 10k. The ascent burns my lungs big time while the steep descent really tests my quads and knees. A day later and my quads are very tender. My right heel is bruised too. I'll have to take a couple days off to let the heel heal. Still, it was worth it. Last Friday was one of those days. One of those days that just flow. No worries, no troubles, no doubts--just pure, unadulterated fun and satisfaction. Maybe it meant more to me because I'd been thinking about this day for many years since hearing about Homie and Bill's 2003 linkup of these two routes. Thinking about how challenging, yet rewarding, it would be if it all worked out. And work out it did. Friday morning at 3:00am was our wake-up. After some bananas, yogurt and some coffee, Nat and I started up the dirt road leading to the South Colony Lakes at 3:45am. 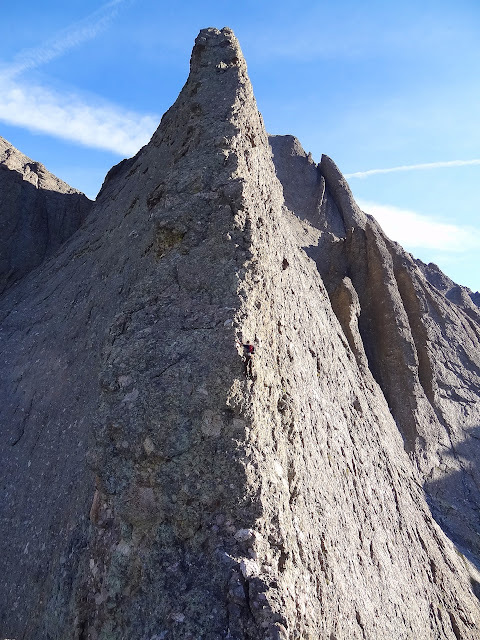 Our plan for the day was to tackle the two Sangres classic fifth-class routes: The Prow of Kit Carson Peak (5.8) and the Ellingwood Ledges of Crestone Needle (5.7). It would be a long day consisting of about 15 miles and 8,100' vertical feet of ascent, all told. I'd climbed both routes three times each. All my experiences on the Prow were very nice and straight forward but I had only managed one dry climb of the Ellingwood Ledges route with my first two climbs of the route in snow and then in rain. 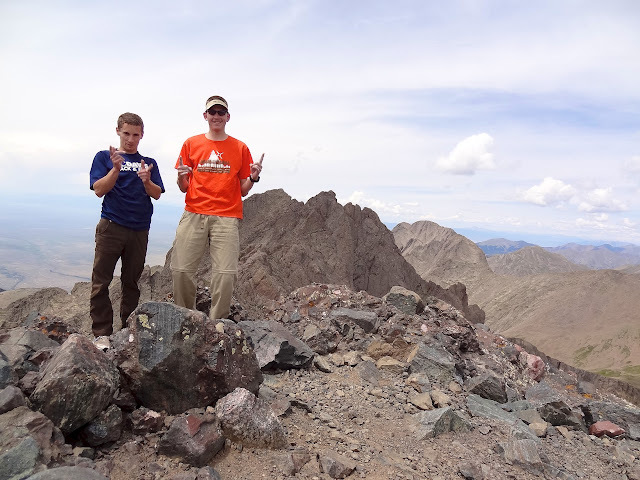 Nat is a young fella and had only climbed three 14ers to this point and had not been on either route. But I knew he was a fit hombre and certainly possessed the climbing skills necessary for soloing these two routes. To keep things simple, pure and light, we left the ropes and protection at home. Knowing the rock on both routes was generally solid and the climbing moderate, I felt confident we'd be fine without the rope and could, therefore, just enjoy the movement and the climbing. To be sure, I certainly don't consider myself a soloist and have no intention of leaving my climbing ropes at home more in the future. 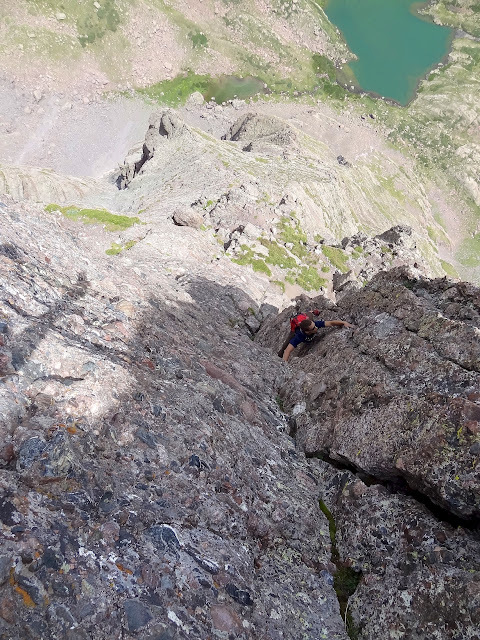 But I realize there's a blurry line between fourth-class scrambling and low-fifth-class climbing and I feel good about climbing low-fifth-class climbing without a rope in the alpine environment. So don't worry, Dad, this soloing thing isn't a new phase for me! We reached the old S. Colony 4WD TH around 4:40am. We wouldn't be running at all during the day but did plan to hike as swiftly as possible. 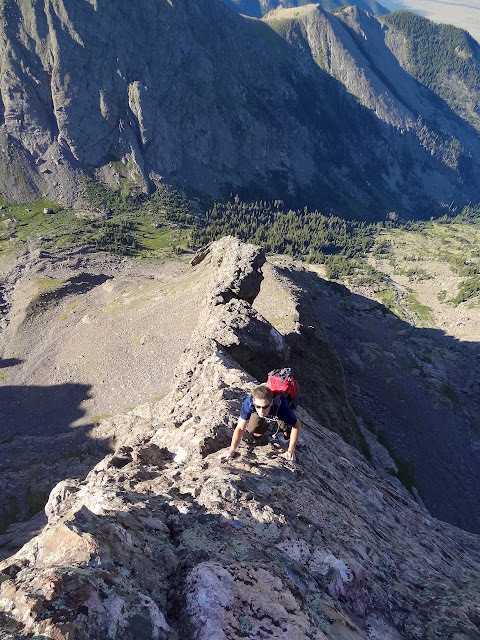 It was still quite dark as we approached the saddle between Humboldt and the Bear's Playground and we could see a pair of headlamps at the base of the Ellingwood Ledges route on Crestone Needle. 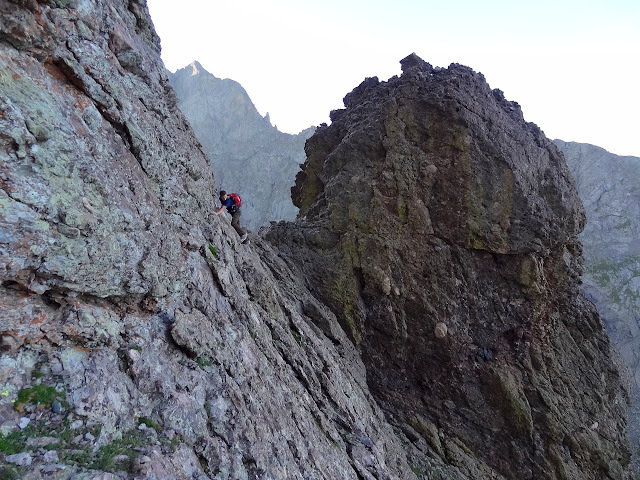 At 6am the light of the sunrise splashing on the Crestone group was gorgeous. We cruised through the grass and loose rocks of the Bear's Playground around 6:15am working to stay as high as possible on the north side of Spanish Creek Basin aiming to intersect the base of the Prow without losing much elevation. It appeared it was working well until we got cliffed-out at the eastern edge of Kit Carson's south gully. Cliffed out in Spanish Creek Basin. We were forced to descend a few hundred feet and then back up to the base of the Prow at 7:30am. There, we changed into our rock climbing shoes and set off up the Prow at 7:40am. In my previous three climbs of the route I had busted out right after the initial crux bulge but that always seemed really airy and a bit more difficult than the reported 5.6. This time I stayed straight up and only slightly left to stay on the face of the Prow. This was much more enjoyable and aesthetic. 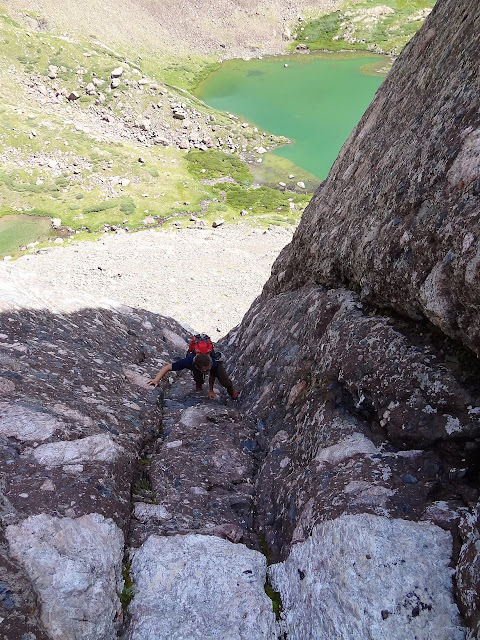 The first pitch of the route is the steepest, most challenging pitch and the subsequent pitches each back off in angle and difficulty a bit more than the previous pitch. Nat on the third pitch of the Prow. The climbing was stellar and it was really nice to just keep on climbing without stopping to place gear or belay a partner. Nat and I had a blast ticking off each pitch with the occasional stop to catch our breath. After all, we were climbing at or above 13,000'. The climbing cruised by and by 9:00am we were on the summit of Kit Carson celebrating an exhilarating climb by eating our sandwiches. We didn't linger on the summit long as we were both excited to cruise over to the Ellingwood Ledges. We descended many hundred feet down KC's standard route before scrambling back up to the summit of Columbia Point. 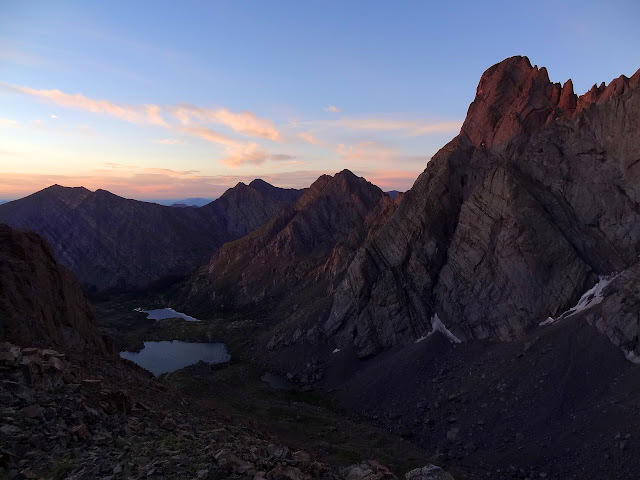 We signed the register and continued east over the summit of Kitty Kat Carson before finding a nicely cairned traversing trail below the summit of Obstruction Peak en route to the Bear's Playground again. From the Bear's Playground we found a nice shortcut gully that led us directly down to the upper South Colony Lakes basin. The gully involved hundreds of feet of scree skiing and went fast and smooth. By 11:00am we were lunching at the base of the direct start to the Ellingwood Ledges route. The weather was holding perfectly and we were confident we'd be on the summit of Crestone Needle in no more than a couple of hours. We donned our rock shoes again and set off up the Ellingwood Ledges route at 11:15am. I'd never been on the direct start pitches of the route so it was exciting to be climbing some new terrain. After the first pitch I stayed straight in the corner system and found it to be a bit steep and spicey for the grade. Seeing that, Nat busted out left and did some climbing on the left edge of the corner system while I stayed in the corner system, more or less. We met back up again at the top of the direct start pitches below the hundreds of feet of fourth class climbing above. The first pitch of the direct start to the Ellingwood Ledges. 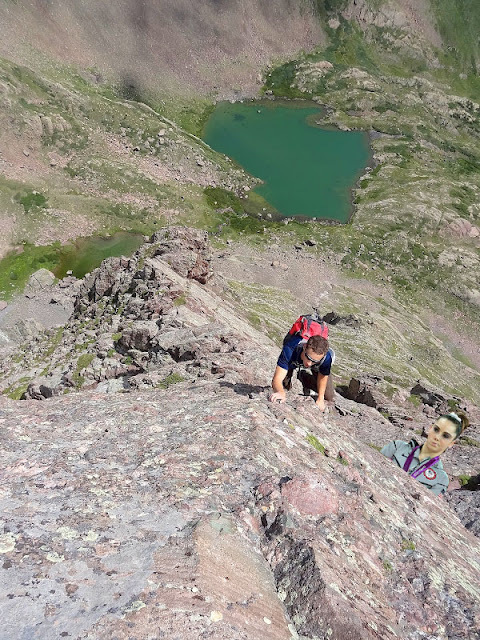 We switched back into our more comfortable trail running shoes for the rest of the route up to the base of the 5.7 crux pitch just below the summit. The views were incredible, the scrambling engaging and the weather perfect. It was great to be right there, right then. A touch of fifth-class action. McKayla was not impressed. We reached the base of the crux 5.7 pitch at 12:30pm and again put on our rock climbing shoes for the next bit of climbing. The crux moves involve climbing through a bulge in a small dihedral. A nice crack in the corner serves up nice jamming and with some good stemming we both snaked our way through the crux without trouble. Nat busts through the crux moves. At the top of the pitch we changed back into our trail running shoes one last time for the last hundred feet or so of scrambling to the summit. We popped out on the summit at 1:00pm to find we had the summit to ourselves. We finished off our remaining food while taking in the view of all the terrain we had covered. It's an impressive view. Stoked on Crestone Needle's summit. We made good time down the Needle's standard south face route down to Broken Hand Pass and then down to lower South Colony Lake where we enjoyed about 45 minutes of swimming and chilling out before getting back on the trail and finishing off the hike back to the car. About a mile from the car we decided it would be easier (and certainly faster) to run instead of walk so we did our only running of the day for the last mile getting back to the trailhead just before 4:30pm.